I began my sewing journey when I was a young mother and my first child was just 3 weeks old. My mother-in-law had been begging me to go to Cincinnati to the Stretch & Sew Store with her to take the eight weeks course on sewing. I did not want to go! I finally agreed just to get her to leave me alone. Little did I know what that eight week journey would lead to. Immediately I found that I loved all things sewing and my three week old daughter to sew for and I was hooked. Twenty-four years ago I gave up public school teaching to work in the sewing industry, and I have never looked back. on May 1, 1989, my husband and I purchased the store where I'd been previously working and teaching. Since then we've made lots of friends and love working with all our wonderful customers. 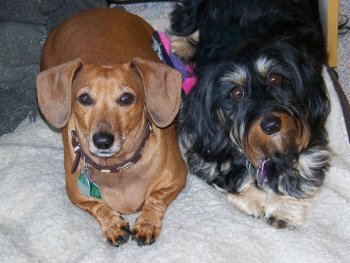 When you enter BERNINA Main Street, look out for the loud alarm system we have in place, otherwise known as Indy who is our thirteen-year-old red smooth dachshund, and Gussie, our five-year-old black and tan long haired dachshund. They will love it when you come.